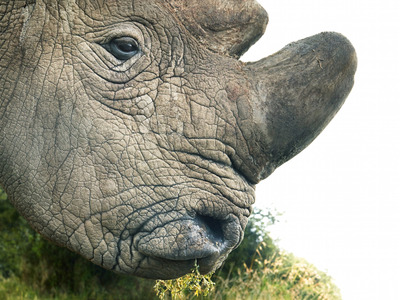 Sudan, the last male northern white rhinoceros in the world, died on March 19. Before he died, he was photographed by Tim Flach for his book “Endangered,” which is the source of the above photo. In that book Flach hopes to make readers and viewers confront our relationship with the end of these species. Sudan’s story, and the story of the northern white rhinoceros, is emblematic of how destructive that relationship can be. The last male northern white rhinoceros in the world, named Sudan, died on March 19. In his late years, Sudan was photographed by Tim Flach, who is known for photos that capture creatures’ moods, expressions, and gestures in ways that make us rethink our relationship with the natural world. The photo above is from Flach’s newest book “Endangered“, which includes text by zoologist Jonathan Baillie. In that book, Flach and Baillie try to help readers consider how humanity has affected these animals. The story is particularly stark for the northern white rhinoceros. And now, it’s just the final two, both unable to carry offspring. The end of the northern white rhinoceros is the same as the story that has made the black rhinoceros critically endangered – and which made other species, like the southern white rhinoceros, vulnerable. Poachers kill them to saw off their keratin horns, which are sold for up to $US60,000 per pound and used to make carvings. They are also ground up to be sold as medicine to treat cancer, hangovers, and erectile disfunction, among other things (rhino horns can’t actually do any of that). Elephants, pangolins, and many other vulnerable species around the world are also threatened by poachers killing them for parts. And in the case of the rhinos, the stories are often particularly horrific. In 2016, about a thousand rhinos were killed for their horns in South Africa. In 2017, poachers broke into the Thoiry Zoo in France, shot and killed a four-year-old southern white Rhino named Vince, and then sawed off his horn with a chainsaw. To prevent that from happening, the staff at Ol Pejeta “systematically dehorned” Sudan, Najin, and Fatu, according to the “Endangered” writers. As sad as the story is, there is a chance that the world could see a new northern white rhino born someday. It would be a technological achievement, relying on an egg from one of the females and frozen sperm of a deceased male, potentially carried by a southern white rhino in South Africa. But before that happens, the world should end the conditions that lead to wanton extinction.